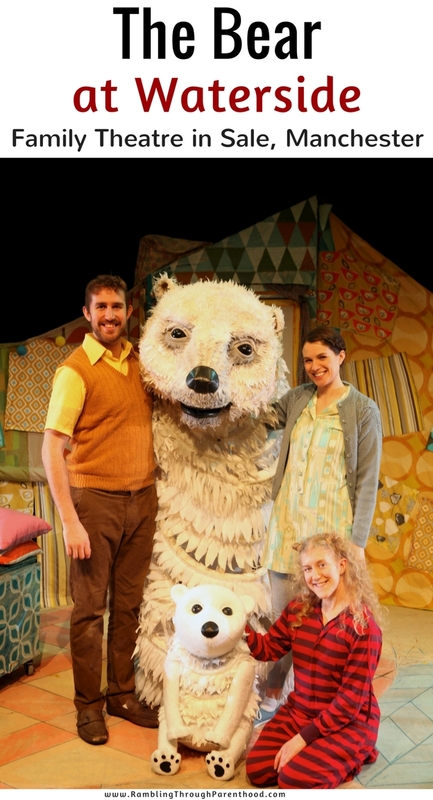 Bear is the story of a little girl named Tilly and a big, white, furry polar bear. 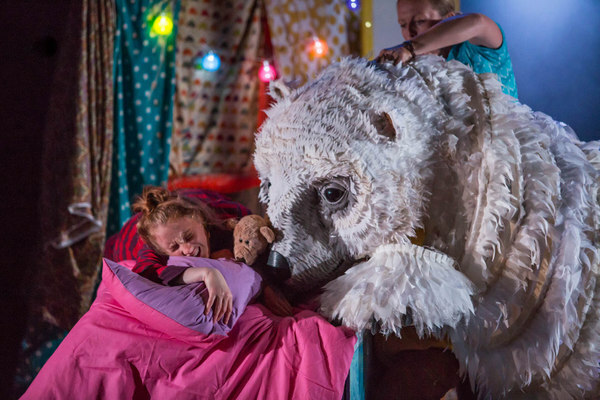 One wintry night, when Tilly is fast asleep in bed, she gets an unexpected visit from The Bear. The Bear has yellow teeth and smelly breath, but Tilly thinks he is soft, cuddly and fun. She is happy to have a house guest and is excited to look after him. But Bears are hard work and it’s not long before Tilly realises just how much! Tilly talks about The Bear with her parents, but they think he is just a figment of her imagination. Is he? Pins and Needles have brought imagination, creativity and humour to The Bear. The production impresses with its inspiring use of music and stage effects. 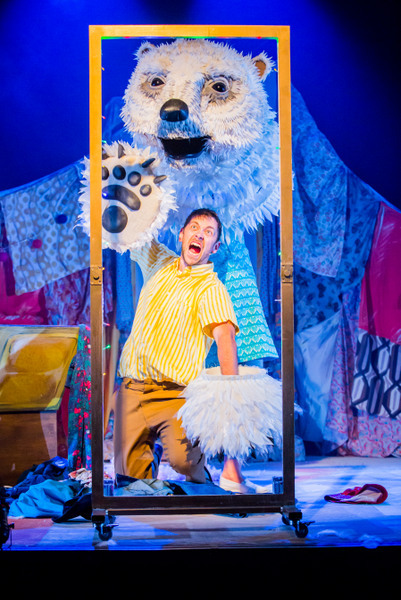 The cast of The Bear do an incredible job managing the enormous Bear puppet while delivering their own flawless performances. The synchronicity of sound and movement is astounding and there are moments when The Bear seems almost life-like. We were invited to attend the press night of The Bear. J was delighted when Tilly, played by Leigh Quinn, stopped to give him a big high five before the show began and she was mingling with the audience. The two then proceeded to pull cheeky faces at each other. Tilly, Daddy (Max Tyler) and Mummy (Lori Hopkins) were also on hand at the end of the show for photo opportunities. 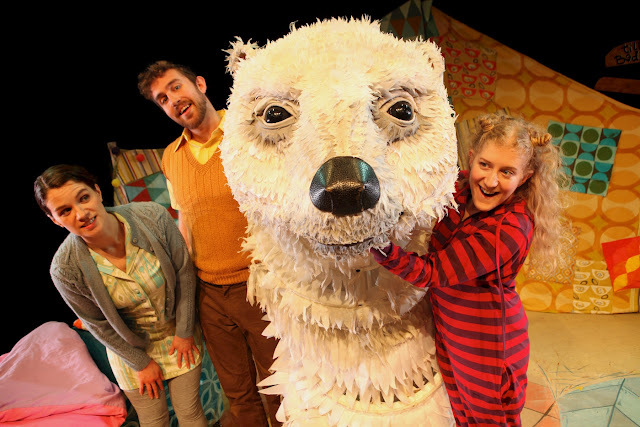 With a running length of 55minutes, The Bear is the perfect festive outing for all the family. Make your experience extra special by buying a milk-and-cookie slumber pack for £2. These can be pre-booked for pickup at the box office. For more information and to book your tickets, visit Waterside on their website. You can read what Jenny from The Brick Castle thought of The Bear on her blog.